SARASOTA, Florida -- A fisherman from Port Charlotte reeled in a hammerhead shark that was so big, it could be a new world sport fishing record, Mote Marine Laboratory reported Wednesday night. It took Bucky Dennis of Port Charlotte five hours to land the beheamouth after it towed the fishing boat 12 miles from Boca Grande Pass. "Because Mote Marine Laboratory didn't have a freezer large enough to preserve the fish, the A.P. Bell Fishouse, 4522 121st St. W., Cortez, agreed to donate space it its freezer." 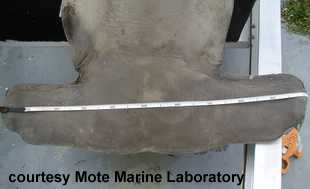 Mote Marine Labs reported. "A.P. 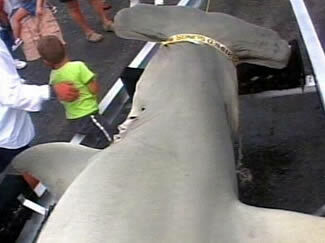 Bell also had a scale large enough to weigh the animal and it was taken there for weight and measurements around 6 p.m. Wednesday." The female great hammerhead was measured at 14.5 feet long and 1,262 pounds, with its hammer measuring more than 3 feet across. She was possibly pregnant. 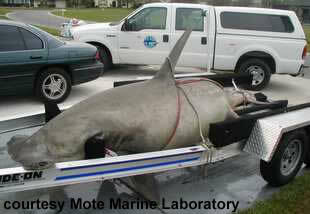 It's dorsal fin is huge," said Dr. Robert Hueter, director of Mote's Center for Shark Research. "She was very rotund." Laws allow fishermen to catch and take one shark per day. 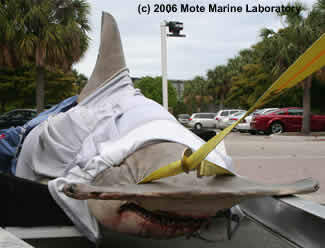 Mote said the catch helps draw attention to the status of sharks worldwide. "We don't encourage the killing of sharks, especially large specimens that help sustain a species. We encourage tagging sharks and releasing them. But we are grateful that this animal has been donated to science. It will help us understand more about these animals," Hueter said. Shark species, in general, are declining, so everything scientists can learn from individuals animal is important, Hueter said. status of sharks and their importance to the world's oceans, and how to protect and save these animals." i want to catch something famous and i want one alive, so i could have a pet to feed my personal enemies to. Great catch! THATS a sledge hammerhead ! And for all you Hyp's that I'm sure will be agast at this catch hammerheads gather by the tens of thousands in the warm southern waters. As an avid scuba diver and admirer of sharks in general, I would have much more enjoyed reading about the successful catch and release of such a beautiful shark rather than the unnecessary killing of it. I realize fishing is a sport and enjoy fishing myself, but a creature that majestic deserved to keep living in my opinion. Man, why do people insist on the senseless slaughter of an important food chain animal? That female was probably very old, and not only important because of being a female, but pregnant, so all those babies died and for what? An ego needing stroking? SHAME SHAME SHAME!! In response to Robert Rolin's comment "and for all you Hyp's that I'm sure will be agast at this catch hammerheads gather by the tens of thousands in the warm southern waters. ", the Great Hammerhead is considered an endangered species by the International Union for the Conservation for Nature, perhaps they used gather by the hundreds of thousands. Perhaps there used to be a deer population of hundreds of thousands in Massachusetts Erich. Oh but thats a different story you all needed somewhere to live and more roads to drive on etc.etc. All I mean by Hyp's is if your going to gripe and give these LEGAL fishermen a ton of manure for catching a fish look in the mirror and think about all the little things you take for granted that in someway affected nature in someway or another. Great hammerheads are endangered and at risk for extinction...the fact that someone would kill this beautiful creature isn't the worst part. The fact that they would do it for sport, and brag, is worse! Catch and release allows fisherman to enjoy the sport of fishing without depleting our oceans of these apex predators. Sadly, the larger the shark, the more important it is to the population as a whole. Some sharks take 20 years to reach maturity and start reproducing. So basically the really big sharks sustain the entire population. Although I disagree with the catching of sharks as a sport, (which is along the same lines as killing Lions and Tigers for sport) I do find small redemption in the fact that they donated the shark carcass to science. Yes every body here has a point. But what I would say is that I do know Bucky. The guy that hook this shark and on top of that has hooked 100 of these shark's from this size and small. And i could say that out of all the shark's he has hooked and landed this is the frist of this size he has taken home. And I also have hooked shark's of this size and have lost the fight. so If I would land A monster like this it's kind of hard to say that i would let it go But he did do the right thing by giving it to science. for a long time they did'nt think they got this big.As to bucky knowing it was pregnant He didn't know he hook this fish where day in and day out these shark's come up and eat our big tarpon. every day you see this in boca grande pass.So At least on this shark they learned about how many pup's theyy could have and they could still have baby's . something that has alot to say for it's self. I think that in a way we can use this shark for science but at the same time what did this shark ever do to us. yes they bite but they think we are their prey. We are in their home so we have every right to get attacked in their eyes. I think that this is a STUPID sport GOD put these animals for us to admire not kill. Well Bucky So you caught a shark on a hook! I am surprised you have not recieved a heros welcome, etc. blah blah blah... Heed Carma...You know you did the wrong thing. Ignorance and stupity both in the same act. Not Priceless. What you all don't realize is this shark was to be released, however, while fighting this shark for somewhere in the neighborhood of 5 hours, she was too tired and worn out from the fight and having to tow a boat aroung the gulf of mexico could not be revived. So she was donated to Mote Marine Laboratory for Research. You can take pics and measurements of any species of fish and submit it for records you do not have to kill them. I am on a team that tag sharks for NOAA's Apex predator program and we do not condone the killing of any shark. LOngliners and comercial fisheries kill more sharks per year than all the recreational shark anglers in the world combined. If you want to complain about something complain about that, call your local fish and wildlife comission and tell them you are concerned about the current commercial regulations on sharks. Until you take a stand where it matters nothing will change. It is really sad that this shark had to die for no reason and then to find that she was pregnant. Just terrible Bucky. Ur definetley right about commercial fisheries & long liners. That still doesn't give us the right to kill sharks. Any sharks! Especially one that great. We can enjoy catch and release just as much. Have a camera handy and practice proper release tech. If we want to change things, let's start with ourselves and lead by example. Bucky, ur an less than intelligent person!! what all you ignorant people bashing bucky dont realize is the fish took the hook bucky didnt put in the mouth. i do shark fishing myself and practice catch and release. but when a shark grabs a hook and pulls a boat around the gulf for 5 hours that alone would tire it out so much that it would die anyways. so before you ecco freaks start bashing people learn the facts about the animal. Are you people stupid? Read up a few comments and see that they never intended to kill the shark. The fight lasted for 5 hours and by the time they got the shark in it was already dead. He did not kill the shark so that he could bring it home and mount in on his wall. Stupid eco freaks. I practice catch and release and would release any trophy caught as long as it could be revived. Seriously folks, don't take every opportunity to bash as YOU are not perfect! Please look at facts before judging, the fisherman did the right thing and donated the shark to science. No loss as I have read many articles and thought before I typed. Nice catch Bucky! Thanks for donating the hammer to science! thle yankees need to stay up north and let us southern people worry about catching these animals. Half of the people on here live where there is no ocean and dont even understand fishing. Anyone want to go for a swim? Hammerheads are vulnerable. They shouldn't be caught for sport. Sharks are magnificent animals. I hate that it's considered "cool" to kill them. I make my liven off cacthin sharks,and guys thats a giant great grey. Never seen anything like it in 11yrs off charter fishin. Good on YOU! nobody saved any buffalo for us! i sure if bucky had the benifit of hindsight, like all the rest of you critics, he may have handled it differently, just like all the divers critising with there dive sticks!! 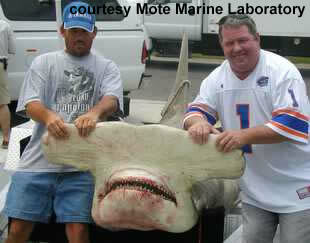 Now that's a huge hammerhead ... the kind you have nightmares about! This is not anywhere near as big as they get, it shows how ignorant the world is about the ocean, which covers 80% of the earth. They rather spend billions exploring space. We just caught a 12'6", 750lb Hammerhead,5-23-09(look it up)and 2 years ago, hooked up with an 18ft giant that would laugh at this one. (didnt land it, we were unprepared) And as far as the shortage, either we are real lucky/good or there aint no shortage! The "northeners" just dont relize what is swimming around in the gulf. I used to be all for killing every shark that swam (the "Jaws" effect). Now when I see pictures like these, it just looks sad and wrong. A couple of grinning rednecks yanking on the head of something they would never dare to face on it's own terms in it's own element. Like shooting wolves from a helicopter...not sporting, just sadistic. Hey tyrone, why don't we use you for target practice instead? I have a lot of paintballs. of coarse we dont have oceans in illinois but i do know many surfers and divers are severly injured or killed by sharks every year.once i move to the cost i will be killing sharks DAILY.not all sharks though only ones notorius for attacking surfers.KNOWN FACT THE NUMBER ONE SHARK FOR ATTACKING SURFERS IS THE BULL SHARK.my cousin surfs and was nearly attacked by 2 sharks.one bit his board the other bumped him with his nose.i want to protect all surfers safety not the sharks.animal lovers think taking one shark out of the ocean realize how many fish u are saving daily a 800lb shark will eat 80lbs of fish daily minimum.now multiply that Xs 365 days a year Xs sharks average 20yr life span.save the fish not the sharks. I am so disappointed that they killed this creature instead of photographing it and releasing it. It is an incredible catch but the men who caught it would have been far more commendable had thet not destroyed this animal for their own glory. At least it was donated to science and maybe we can learn more about and better understand hammerheads. So sad that she was pregnant. What a loss. thank you bucky for catching such a great specimen that was generously donated to science to help us further our knowledge of these creatures.All you complaining about the death of this fish should also no bucky uses live stingrays as bait lol. How could someone kill such a magnificent creature?? I'd rather watch the shark kill the scumbsags who killed it than even hearing of something as psychotic like this! You know that guys fish in the same areas to make money by guideing and tournament fishing? I fish down there jsut for fun but there are guys out there where alls their income is based on catching a fish. And when your fish gets eaten by a shark and thats your only one of the day then you dont get paid. That area has more sharks than noted. And yes he did use live stingray, the sharks main pray. So all of you enviromentalist people that are having a fit about killing one shark... get a life. These guys need money like everyone else. If it wasnt for these tarpon and tournaments for the tarpon, the guides would have no money to support a family. 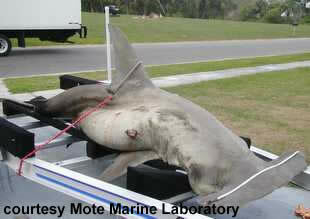 So before I bid you a good day, there is more than just those two sharks in Boca Grande Pass, Some even bigger. *tyrone Best comment on this site... ignore the twerp who commented right after you. im reading a lot of stuff on here, and most of it doesnt make sense. what people need to realize is that fisherman, myself included, are not out to kill everything we can to show it off. i shark fish during the winter months because it is fun, not because i want to kill anything. my friends and I release 99% of the sharks we catch. so do a lot of other people who shark fish. granted, there are some people out there who do it just to kill and then brag, but you cant judge us all over a few. i completely agree that the facts are most animals and fish in the ocean are more endangered than we think. the japanese fishing fleet has almost wiped out bluefin tuna, longliners are destroying the population of several species that are not even target fish. dolphins, turtles, sharks, etc. are all dying on longlines and nets everyday. in my opinion, the regulations should be on commercial fishing, not recreational fishing. if you want to get extreme, here's my idea. ban commercial fishing. thats right, i said it, ban all commercial fishing. if you want fish to be part of your diet, learn how to catch it. if you dont live near water, i guess your out of luck. that is the only way the waters of the world will be able to recover from what we as humans have done to it. hopefully i have said something that will make sense to someone, and maybe they will tell someone else who thinks it makes sense. something needs to be done, thats for sure, but picking on one person is not it. I am proud of you Mr Bucky for the big hammerhead shark you caught.In Kiribati many people used to fish different sharks and some have caught more huge sharks but no one was keening in keeping records of big fish. IF YOU LIVE , SURF, AND WORK ON THE WATER WITH IN 50 MILES OF THIS HUGE SHARK WOULDNT YOU HAVE WANTED HIM TO KEEP IT? IVE SEEN THAT SHARK IN PERSON ,AND PEOPLE IT WAS NO JOKE!! TNX BRO. I raised my son in those waters, know Mote Marine well. I wish it had been a catch & release. She is magnificent in all her beauty. She's probably Hitler's Wife. If U live near her waters, U know the stories of Hitler. My son is an expert on sharks, his heart is sad as many.We've caught many sharks by accident, fishing for Tarpon in Boca Grande. I always released. Sharks R very important to the lifecycle.I bet it was great reeling her in, but did she really have to die ? U guys need to Christen Her. Hope Mote can learn.I'm naming her Hilda the Hammerhead, may she rest in peaceful waters.Most fishermen have respect for their waters.Congrats Bucky. I am more concerned with the spelling of those making complaints about Bucky's catch. In their defense however, if the cavemen had not of killed off all the dinosaurs, the rest of us might be able to see them in person. Danged poachers! Oh, they didn't...what did? I guess we better get them while we can, because something eventually will! Perhaps Achmed-im-a-son-of-less than respectable female unleashing a nuke. Oh and one other thing... all you tree hugging liberals remember your own rules... the 55 baby sharks are not sharks they are only fetus's. Double minded twits. I think it is sad to kill this shark for sport and the fact that it was pregnant is more heartbreaking. As for donating it to science, that does not justify the killing of it for sport. It should have been released. The sharks are already being killed for a delicacy. If the man had gotten in the water with the shark to try and catch it then I think it would be a manly sport. I think it's hilarious. I bet you wouldn't be so thoughtful and respectful of this or any shark if it was trying to kill you or if it had killed someone close to you. You'd be out for blood. Of course some people would just roll over and let something "magnificent" kill them, but that's natural selection. I also like how some of you play favorites, thinking one animal deserves to live more so than the other, because it's beautiful. That's not shallow at all. I bet most of you are the type that freak out when they see a spider and then kill it. After all it's just a spider, right? Or how about stepping on ants or any other kind of bug. For Pete's sake give your brains a chance. If I had it my way, I'd eleminate all the sharks from the coast, hunt them down continuously until they realised the coast was a danger zone and a "no-no spot". When you stop hunting predators they lose their fear of you and are more likely to attack. Oh. On another note, whoever said, "let's throw him in the water with the shark", congratulations, that's borderline nazi crap. Next you'll want to put people in ovens, because they "offend nature". Interesting debate. Urdnot Wrex, I am afraid your idea of hunting down the predators or they will lose their fear of us is...well silly. Sharks do not posess the cognitive power to understand this concept - in fact most predatory species do not - they lack the "fight or flight" machanism as is were. I believe that conservation is important, and that whenever possible catch and release is preferable. However, My understanding is that this fisherman "bucky" routinely practices this, and only kept this shark because of it's "trophy" status. In this regard he is to be congratulated. Futher to this, the greatest threat to oceanic and thus all life, is comercial fishing practices. Illegal poaching and overfishing continue to drain already overdepleted fish stocks world wide and tip the balance of the ocean's eco-systems. For some of you who have responded, crying about this one instance is akin to worrying about locking the door while our house burns down. Direct your energies to where they can do the most good. And please, before you respond to anymore online articles, buy a thesaurus/dictionary and learn to spell! Are you kidding me? This is just as messed up as whale hunting! you're killing an animal you cannot even eat, for sport! shame on all of you who support this! "Thanks to this donation," Hueter said, "we hope to be able to teach even more people about the status of sharks and their importance to the world's oceans, and how to protect and save these animals." That is so fornicating backwards its incredible!! you're killing a beautiful female shark that could have spread her strong genes and given birth to plenty of baby hammers. You know what I say? Every human, in EVERY country, and on EVERY boat, needs laws and regulations put on them when it comes to animals. Someday, I'm going to do something about all of you. you just wait. what a bunch of crybaby liberals. get lives and do something that matters. you are all a bunch of tree huggers. all of you. if you had the opportunity to land a world record fish you would all do it. cheers to bucky for doing what everyone one of us (and you) would have done! in celebration of you, bucky, i shall now go have a shark steak!!! I understand that catching a world record means nothing unless it gets weighed and to do that you have to kill it. Each time he tries catching one of these sharks he has the intent of killing it if it's big enough. It's sad that even as we've seen the population of nearly every shark shrink to a fraction of what it once was he still needs the satisfaction of having his name in a book. He killed 56 sharks just so we could all know he caught the biggest one. I've caught quite a few sharks, big and small. However, every time a shark is pulled to shore or the side of my boat I let it swim back off into the ocean. Knowing I caught a shark that still swims through the ocean contributing to it's species has more meaning to me. Well done guys - still, if it makes you feel more like a man. That Hammerhead is worth 20 of you dumb rear orifice red necks, and we all have to suffer the consequences - our ocean is just a little bit poorer after your pointless action. I caught a 10 foot 400 lb hammerhead. Would this be considered a record? My father was a skillful fisherman..he used to fish different big sharks but we have no camera to photo his caught but to compare with this hammer shark I hope this was more big than my father's caught.